Canoeing Travel Insurance, we compare policies to cover you on against loss or damage for your trip. Canoeing is an outdoor activity that involves the use of a canoe to get across water. The canoe is open from the bow to stern. 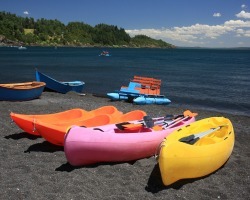 Canoeing is popular over most areas of the world, especially in places such as Brazil, New Zealand, Australia and Finland. Canoeing can be completed without a professional present but if you are unsure of what to do it is always best to involve a professional. Although canoeing is not seen as a very dangerous sport it does come with risks and therefore it is essential to ensure your insurance covers canoeing before you take part. As with all other insurance policies it is important to ensure that the insurance policy you have taken out covers all aspects of your travels, to ensure that this is the case with your policy it is important to fully read the terms and conditions. Don’t worry if you have just taken out a policy and it doesn’t cover everything you need, there is a 14 day cooling off period with all insurance policies. If you are canoeing as a one off, it may be more beneficial to look at single trip policies or even a single day policy. Listed below are a number of policies who offer cover for canoeing but please do look at the policies carefully to ensure they do cover all of your requirements. It is important to ensure that the policy will cover the grade of canoeing you would like to take part in. Grade Two: Moderate - faster water, the rapids are more frequent, with occasional rocks and small stoppers, but there is always an obvious channel. Grade Three: Harder - the pace is quicker, the waves are fairly big, rapids become more continuous and stoppers which can hold a boat firmly are present. Although an obvious path should still be clear it is essential to be able to move the kayak well. Grade Four: Difficult - there are long and heavy rapids, with irregular waves. The stoppers are strong and powerful and there is no obvious route from the water and a bank inspection is normally necessary. Grade Five: Extremely difficult - even longer rapids, with large drops and big waves. There are dangerous stoppers and rocks, this is a challenge to any ability of canoeist. Continual inspection and protection is often necessary. The danger risk is severely increased. Grade Six: Limit of navigation - this is where a line down will only just exist and luck often plays a part; the risk to life is great. The day selected to complete these sort of canoes are essential. JS Travel Insurance offer a policy which covers canoeing up to level 5 as long as the activity is adequately supervised and the appropriate safety equipment is worn at all times. A quote can be obtained using the form located at the bottom of the page about canoeing travel insurance. If you have pre-existing medical condition it doesn’t mean that you are unable to gain insurance, as JS Travel Insurance specialise in this area. SportsCover Direct covers canoeing in up to grade 5 rivers. SportsCover Direct can provide single day cover or annual cover. They also provide ‘Activity TopUp’ which means there is no need to double up on insurance policies just so you can complete a single activity, you can just top up one activity. This could be very useful whilst back-packing and for activities you are only doing for a day. Flexicover offers travel insurance which covers canoeing in up to grade two rivers at no extra charge. However the insurance is only valid if you are compiling with local laws and regulations as well as wearing the recommended safety equipment. Canoeing at any level and ability poses risks. It is important to ensure that you have dry and warm clothes to change into to avoid hypothermia. There is also a risk of drowning when canoeing, so being able to swim is essential. The most common injuries from canoeing are muscle strains, concussion and broken bones. It is also essential to ensure the condition of the equipment is excellent to reduce the risks of injury. You should check that you are using the correct paddle for the type of water you are in. Despite the seemingly large number of risks, canoeing in the correct conditions is considered safe.